Brasso wadding polish comes to us from England. Brasso is made of a thick cotton wadding roll impregnated with mineral spirits and micro-fine aluminum oxide abrasives. 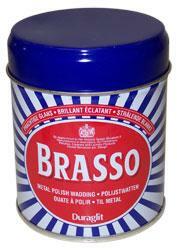 Brasso is safe for brass, copper, chrome and other metals (not for use on plated finsihes). Each 75g can contains a roll approx. 2-1/2" wide x 16" long.